Gardone Val Trompia, Brescia, Italy has been a center for iron working and weapons making since the middle ages, and of firearms manufacture since at least 1526 when Giovanni Antonio Beretta began production of arquebus barrels. 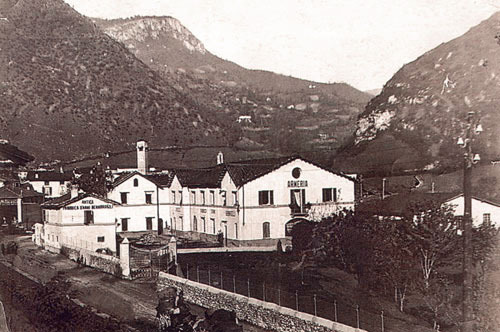 The Bernardelli forebears entered the firearms business in 1631 when one Bartolino Barnelli married into the noble Acquisti family which owned several gun factories in Gardone Val Trompia. The following year Bartolino’s sister married his wife’s brother to further seal the tie between the two families. No explanation is given as to how the family name morphed from Barnelli to Bernardelli, but in 1721 some brothers Bernardelli are on record as purchasing a large gun factory in Gardone Val Trompia. The company which exists today was founded in 1865 by Vincenzo Bernardelli with the establishment of a large factory with water-powered machinery. The Bernardelli company still used water to power its machinery right up to the end of the 20th century. Vincenzo Bernardelli originally made damascus twist shotgun barrels. Later, when his son joined the business, the company began making whole shotguns, which was the company’s primary business for most of its existence. In the late 1920s Bernardelli manufactured components for Alfa Romeo aircraft engines. From 1930 to 1933 the company manufactured the 10.4mm Italian service revolver known as the System Bodeo, Modello 1889, with a total production in excess of 25,000. This was their first handgun. During World War II the company began manufacturing artillery fuses, production of which continued until 1986. 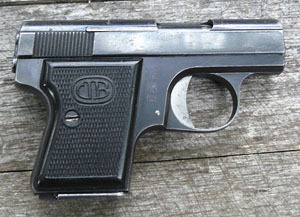 After World War II, Bernardelli introduced its first self-loading pistol, the VP (Vest Pocket) Model, which was based on the Walther Model 9. In 1997 the V. Bernardelli company was forced into bankruptcy and its assets, brands, and trademarks were acquired by the Turkish company Sarsilmaz. My understanding is that most production was moved to Turkey and that now, once again, only shotguns are being made under the Bernardelli name. Parts for older guns are no longer available from Bernardelli. I am referring to this pistol as the “VP” which stands for Vest Pocket because I have been unable to locate any other model designation for the gun. It is sometimes referred to as the “VB” because of the initials on the grip, but the VB initials, which stand for Vincenzo Bernardelli, are on almost every Bernardelli pistol ever made and so can hardly be considered a model designation. 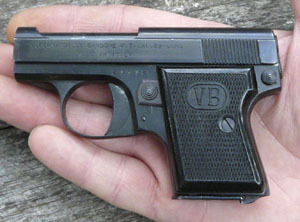 Like the Walther Model 9, the Bernardelli VP is a very small unlocked breech striker-fired .25 caliber (6.35mm) pistol with a barbell-shaped takedown latch at the rear. Unlike the Walther, the latch is released by a small button behind the upper portion of the left grip. The Bernardelli has a full length slide that covers the barrel, with an external extractor on the right side, an internal connector on the left side, and a six-shot magazine--it incorporates a magazine safety. An extended eight-round magazine is also available that provides a better grip on this very small pistol. The Walther has an open-top slide, a top-mounted internal extractor, an external connector on the right side of the frame, a six -shot magazine, and no magazine safety. The Walther has its ejector built into the frame, whereas the Bernardelli uses the firing pin as the ejector. Both guns have two-inch barrels, and cocking indicators. The Bernardelli has a narrower slide but a deeper grip. The sear mechanisms are similar, but the rest of the lockwork is different. The Walther safety blocks the striker, whereas the the Bernardelli safety blocks the connector. 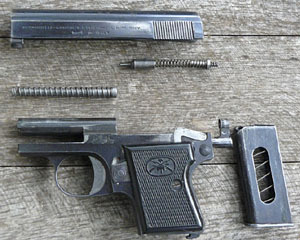 The Bernardelli disconnector is a sickle-shaped lever on the left side of the gun which is depressed by the slide as it moves toward the rear. It is held in place by the slide and usually falls off when the gun is field stripped. The Bernadelli barrel is fixed and press fitted into the frame. My VP is well finished, inside and out. My VP is marked on the left side of the slide “BERNADELLI-GARDONE V.T. ITALIA-CAL 6.35 BREV.” and those exported to the United States are marked “MADE IN ITALY”. On the right side of the frame are the Italian proof marks. On the pistol shown here are the mark of the Gardone Val Trompia proof house and the definitive proof for smokeless powder loaded to 30% over pressure. Beneath the proof marks is stamped the year of manufacture, in this case 1949. The serial number was stamped on the rear face of the grip tang, as well as on the underside of the slide and the underside of the barrel mount (it can only be seen if the barrel is removed from the frame). There is a photograph of an engraved VP in Hogg and Weeks that is marked only “CAL 6.35 BREV. BERNADELLI”. In 1949 Bernardelli introduced the Baby model, which was simply the VP chambered for the .22 long or the .22 short cartridge. The magazine holds six rounds. I have read that the long and short versions are the same gun with different magazines, but cannot verify this personally. Unlike the VP, the Baby has an open-top slide and does not have a loaded-chamber indicator. My Baby is marked “V. BERNADELLI-GARDONE V.T. CAL .22 LONG.” on the left side of the slide. On the right side of the frame are proofs identical to those on the VP. There is a date code, “XXIV”, which supposedly means it was made in 1968. My Baby is reasonably well finished, with no rough spots on the inside, but you can see faint mill marks on the frame beneath the blue. but the few photographs I have been able to locate show a gun with that is virtually identical to the VP and the Baby, though the grips have been redesigned and the barrel may be a millimeter or two longer. The Model 68 was available in .25 caliber, .22 short, and .22 long. The extended 8-shot magazine continues to be available for the Model 68 in the .25 caliber version. Hogg and Walter state that production ceased in 1970, but the gun was still being advertised on the company website in 2003 in all three calibers, and even in 2009 the Bernardelli website still listed the Model 68--the only pistol listed. 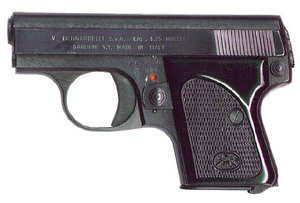 The 6.35mm Bernadelli is marked “V. BERNADELLI S.P.A. CAL 6.35 MOD. 68 / GARDONE V.T. MADE IN ITALY ”. In 2009, Sarsilmaz (the Turkish company that bought Bernardelli) reintroduced the gun as the Sarsilmaz P6. At the range the VP shot well for a short time, then began failing to feed and eject properly. I finally figured out that the barrel was deformed slightly just past the chamber. It had effectively been “shot out.” However, barrels are still available for these guns and can be easily tapped in and out with a hammer and a brass punch. I replaced the barrel and the recoil spring and the gun functions well now. It will keep all its shots on a paper plate at 20 feet, but will rarely hold a group less than 4 inches across. The Baby has always shot well, typically holding about a 3 inch group at 20 feet. It feeds and ejects reliably. I consider these guns curiosities. They are fun to plink with, but can hardly be considered serious self-defense weapons, although if you could throw one hard enough and with sufficient accuracy it would have much the same effect as a rock. Since the safety only locks the connector, I fear the striker could be released if the gun were dropped, so I would not carry one with a round in the chamber. For years I thought the magazine for the VP only holds 5 rounds, but a reader wrote to tell me that his magazine holds six. Then he bought a second magazine, but it would only take 5. He noticed that the angle of the turns of the magazine spring seemed to be opposite the angle of the follower on the 5-shot magazine. Ultimately, we determined that many of the Bernardelli magazines have the spring in backwards. It’s a bit tricky to disassemble the magazine, but I was able to use two small screwdrivers to pull the spring all the way to the bottom of the magazine. After a few minutes of jiggling, the magazine follower fell out. I was able to remove the spring, turn it around, and with determined effort replaced the follower. Now my magazine holds six rounds. Make sure the gun is empty, then pull the trigger to uncock it. Press the takedown button on the left side of the frame behind the grip. The bolt should slide back under spring tension, but you might have to pull it back manually. Pull the slide back slightly, lift the rear up, and ease it off the front of the frame. The recoil spring and guide rod can then be removed from their recess beneath the barrel. Note: Be sure to notice the location and position of the disconnector as you remove the slide, so you can put it back on when it falls off. Between 1989 and 1992 Iver Johnson Arms manufactured a copy of the Bernardelli VP, which they called the Iver Johnson Compact .25. According to Bill Goforth, the company manufactured the frames and slides in the United States but imported the internal parts from Bernardelli in Italy. Like all of Iver Johnson’s late auto pistols, the gun was problematic, and Goforth says the company simply did not have the time or money to resolve the problems. Goforth states that production was sporadic during the last three or four years of the company’s existence, and that less than 1000 were manufactured. Interestingly, an Iver Johnson advertisement from this era has the note: “Also available Compact Elite .25 24 Karat gold, hand engraved with Ivorex grips.” I have absolutely no evidence that the Compact Elite was ever manufactured, but if it were it would be highly collectible. The Compact .25 slide was marked on two lines on the left side “IVER / JOHNSON Jacksonville, Ar” and had a stylized owl’s head logo. The right side of the slide was simply marked “25 CAL.”. The serial number was on the right side of the frame, behind the trigger. The grips were plastic, with the Iver Johnson owl’s head logo in a circle at the bottom of the left grip plate, and the IJA monogram in a circle at the bottom of the right grip plate. “The Guns of Vincenzo Bernadelli,” by Larry Brown. Shooting Sportsman, September/October 2003. Iver Johnson Arms & Cycle Works Firearms, 1871-1993, by W.E. Goforth. Gun Show Books, Hudson, WI: 2006. Pistols of the World, by Ian Hogg and John Walter. Krause, Iola, WI: 2004.